Kid Junction Chantilly is celebrating five years of providing fun to young children. In honor of its fifth anniversary, this large indoor playground in Northern Virginia is hosting a celebration on Sunday, August 19, 2018, and admission is free to everyone! The Kid Junction Summer Mega Event takes place all day, 10 am to 6 pm. Special activities include balloon twisting, face painting, nail art, a moon bounce, shows by young magician Drew Blue Shoes, a petting zoo, visits by princesses and superheroes, a touch-a-truck and more. The usual fun Kid Junction features all will be open for guests to enjoy. This includes climbing tunnels, toys, arcade games, and pretend-play rooms. Kid Junction also is teaming up with Chick-fil-A South Riding to sell Chick-fil-A lemonade to benefit the charity Alex’s Lemonade Stand, which helps fight childhood cancer. Parents also will be able to get ID cards for their kids at the event. The anniversary event, therefore, is just the start of other improvements you will see this year! To learn more about Kid Junction (a long-time Fairfax Family Fun sponsor which we love! ), visit the website. To get updates on the event, visit the Facebook page. 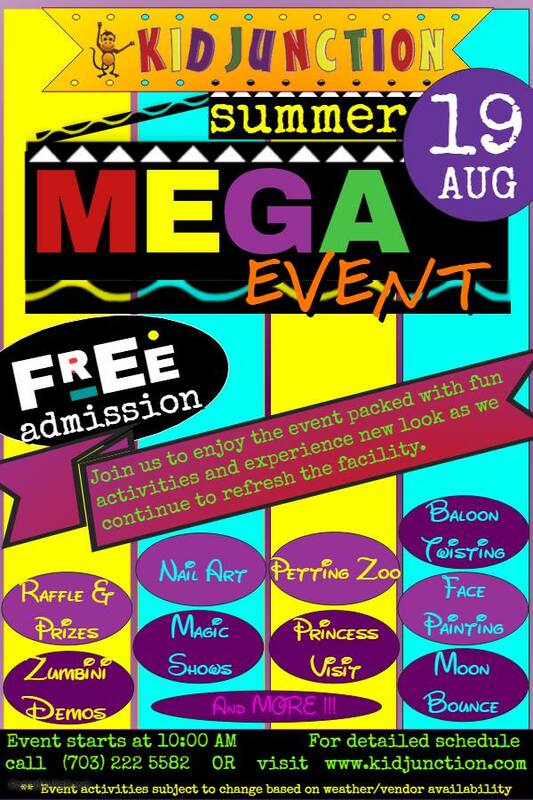 Share the post "Kid Junction celebrates with ‘Mega Event,’ free admission"